In this investigation, we develop the analogous image reconstruction strategy for MI that exploits structural information as a soft-constraint in the microwave property estimation process and compare its performance with a standard no-prior (Levenberg-Marquardt) regularization. The soft-prior algorithm encodes spatial information from different regions of the tissue being imaged into a regularization matrix that associates points within the same region of the reconstruction mesh to minimize variation within each zone. 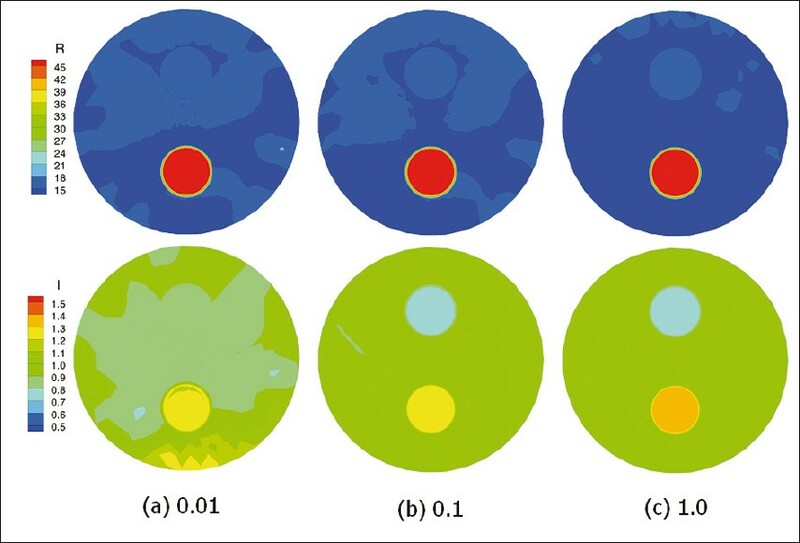 The focus of the study is to evaluate quantitatively the accuracy of the microware property estimates recovered with and without soft-prior regularization in a series of simulation and phantom experiments including under conditions of false inclusions. While MI studies published in the literature have considered priors in various forms, the spatially encoded regularization matrix used here has not been previously implemented or otherwise systematically evaluated when applied to property estimation governed by the time harmonic wave equation. Further, the property accuracy improvements observed with the approach when used with MI phantom data offer the first evidence that the technique produces quantitatively superior results under experimental conditions. Breast MR is widely used clinically and despite pressures from healthcare cost containment, the number of breast MR imaging studies is likely to continue to grow in the future because of their exquisite soft tissue delineation. However, breast MR has a substantial false positive rate for cancer. As a result, significant opportunities exist to supplement the diagnostic information derived from MR with another modality such as co-registered MI which may be used as complementary image data to improve the specificity of breast MR, especially if the MI properties in areas of contrast enhancement can be accurately estimated. Indeed, this same soft-prior technique resulted in a 26% decrease in the root mean square (RMS) error of the absorption and reduced scattering coefficient images when prior structure of a phantom was used to guide the NIR property estimation  and the prospect of attaining similar positive results with MI has motivated the algorithm development and evaluation described here. This implementation is referred as a Gauss-Newton iterative algorithm with a variance stabilizing transformation. , In addition, a dual-mesh approach is used where the forward solution is computed on a rectangular uniform FDTD lattice, while the electromagnetic property parameters are reconstructed on a triangular element mesh placed concentrically within the antenna array. where N i is the number of nodes in region . Based on this construction of L, L T L in equation (4) approximates a second-order Laplacian smoothing operator inside each region, which limits the smoothing across the boundaries of distinct regions. , Since the structure of the tissue being imaged does not change during the iterative image reconstruction algorithm, both the regularization matrix L and Laplacian smoothing operator L T L, can be calculated once and stored at the beginning of the procedure to avoid redundant calculations (making the algorithm more efficient). where is the reconstructed dielectric property value (either permittivity or conductivity) at node n (in the reconstruction mesh), whereas is the true value of the selected dielectric property at that location. To account for the fact that nodes in the reconstruction meshes are not uniformly distributed, a weighting factor has been added at each location computed as where An is the area of the elements surrounding node n and A is the total imaging area. Because of the iterative nature of the reconstruction procedure, a stopping criterion is needed to terminate the algorithm. Since the algorithm typically converges within 15 iterations, we allowed all reconstructions to execute for 20 iterations as a simple way to ensure convergence in each case and verified that the squared error (i.e. equation (2)) was below a threshold (relative to the squared error produced by the initial estimate) of 0.2 in each case. In the current study, we evaluated MI with soft-prior regularization relative to MI with no priors in simulation and phantom experiments where the boundaries of different regions were known. [Figure 1] shows a schematic of the imaging geometries considered. The "Simulation Results" section reports simulations involving variations in mesh resolution and synthetic measurement noise. The effects of parameter coupling and arbitrary inclusion geometry are also investigated. The "Phantom Experiments" section describes analogous results from phantom experiments which consider the impact of false inclusions as well. Simulated measurement data were generated by our hybrid boundary element/finite element approach  for the circular target shape in [Figure 1]. The images were reconstructed at 1300 MHz using update equation (6) with no spatial information (on reconstruction parameter meshes with 473, 915, 961, and 1725 nodes), and update equation (4) with the soft-prior regularization defined in equation (7) (on the 915 and 1725 node meshes which had external and internal boundaries conforming to the outer surface and lower circular inclusion in [Figure 1]). The cylindrical inclusion centered at (x,y) = (0,-3 cm) with a radius of 1.4 cm and the dielectric properties of εr,Tu = 51.16 and σTu = 1.44 S/m was embedded in a background medium with the dielectric properties of εr,bk= 15.60 and σ:bk = 0.90 S/m. Noise ranging from -110 dBm to -80 dBm was added to the synthetic measurements. [Figure 2] shows reconstructed images at 1300 MHz (noise level of -100 dBm) using the no prior (on 473, 915, and 961 node meshes) and soft-prior (on the 915 node mesh) regularizations, respectively. Without spatial priors, the reconstructed images are very similar which indicates that increasing the number of nodes or changing their distribution to be preferentially greater within the inclusion in the reconstruction mesh does not improve the quality of the recovered images. Both regularizations recovered the inclusion in the permittivity and conductivity images, but those from the soft-prior technique are more accurate in terms of the recovered property values. In addition, the recovered background permittivity and conductivity values are more uniform in the soft-prior case. [Figure 2] confirms that these improvements are not due to the reconstruction mesh, but to the regularization matrix. The weighted permittivity and conductivity errors without priors were 0.172 and 0.128, respectively, while those with soft-prior regularization were reduced by nearly a factor of 8 to 0.028 and 0.016, respectively. 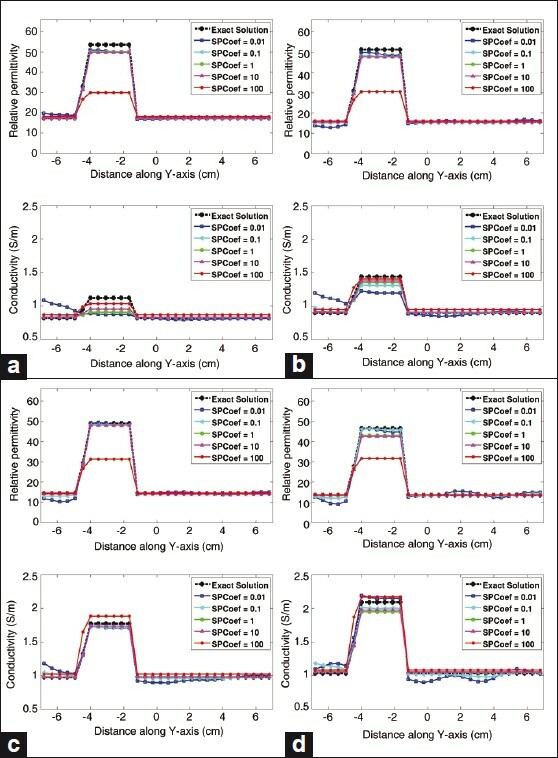 Figure 2: Simulated 1300 MHz reconstructed permittivity (top) and conductivity (bottom) images (a) without priors on the 473 node mesh, (b) without priors on the 961 node mesh, (c) without priors on the 915 node mesh with preferential node deployment in the inclusion, and (d) with soft-prior regularization on the 915 node mesh. In order to compare the reconstructed and the true dielectric properties, vertical transects of the permittivity and conductivity profiles along the y-axis are shown in [Figure 3], for added noise levels of -110, -100, -90, and -80 dBm. In this case, the measurements ranged in amplitude from -30 dBm for the nearest antennas to -87 dBm for those farthest away from the transmitter. The signal to noise ratio for the lowest amplitude measurements with -80 dBm of added noise was 7 dB. As expected, artifacts increased in both the permittivity and conductivity images without priors as the noise level rose, especially in the -80 dBm conductivity images where the fluctuations are significant. The soft-prior regularization tolerates the added noise much better with relatively minor decreases in the recovered inclusion permittivity and only slightly greater reductions in conductivity at the highest noise level. Using soft-priors, the reconstructed permittivity values were underestimated (~10--15%) in the inclusion at all noise levels. Notwithstanding, the method clearly detected the inclusion given the large property contrast with the background. In addition, even when considerable noise was added to the measured data (-90 dBm), the algorithm with soft-prior regularization recovered the inclusion conductivity very accurately, and started to underestimate (~15%) its property values only at even higher noise levels (-80 dBm). Figure 3: Comparison of the 1300 MHz reconstructed permittivity (top) and conductivity (bottom) values using no-prior (Levenberg-Marquardt, LM) and soft-prior regularizations with different levels of added noise: (a) -110, (b) -100, (c) -90, (d) -80 dB m.
In order to study the effects of no prior and soft-prior regularization on reconstruction parameter coupling, two simulation experiments were performed in the same background medium (εr,bk= 15.60 and σbk = 0.90 S/m). In the first case, no permittivity contrast existed in the inclusion region (dielectric properties were εr,Tu=15.60 and σTu = 1.44 S/m). The second experiment had no conductivity contrast in the inclusion (dielectric properties were εr,Tu= 51.16 and σTu= 0.90 S/m). 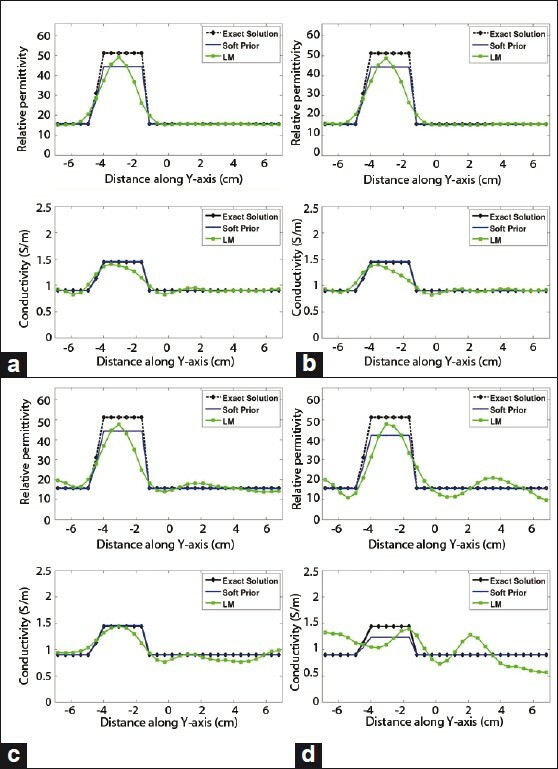 [Figure 4] shows transects of the 1300 MHz reconstructed permittivity (top row) and conductivity (bottom row) profiles along the y-axis for the first and second experiments (in the left and right columns of the composite figure), respectively (with added noise of -100 dBm). While both methods (no-priors and soft-priors) handle the no-permittivity contrast case [Figure 4]a effectively, the soft-prior regularization is clearly superior when no conductivity contrast exists in the inclusion [Figure 4]b. The soft-prior regularization profile almost overlaps the exact solution, whereas the no-prior regularization curve has significant differences with the exact solution. Quantitatively, the permittivity--conductivity parameter coupling is only about 5% with the soft-prior regularization in both [Figure 4] cases. Here, we consider the permittivity--conductivity parameter coupling to be the relative error (equation 8) between the true values and the recovered properties in the region of the inclusion in the no-contrast images (i.e., reconstructed permittivity in the inclusion in [Figure 4]a (top row, left column) and conductivity in [Figure 4]b (bottom row, right column)) when using the soft-prior regularization. An arbitrarily shaped inclusion [Figure 1] with the dielectric properties of εr,Tu= 40.0 and σTu = 1.30 S/m was embedded in a background medium with the dielectric properties of εr,bk = 15.60 and σbk = 0.90 S/m. With the addition of -100 dBm of noise to the data, the images were reconstructed at 1300 MHz both with and without priors, as shown in [Figure 5]. 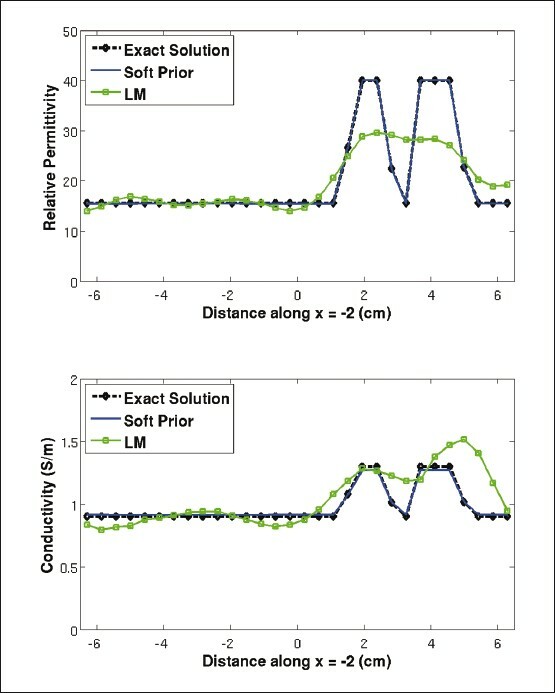 [Figure 6] shows transects of the reconstructed permittivity (left) and conductivity (right) profiles along the line x = -2 cm using the two regularizations along with the exact solution. While the LM regularization images show an object at roughly the correct location, both the permittivity and conductivity component of the soft-prior images recover the complex shape and properties exactly. In addition, the level of artifacts in the background is significantly reduced with this approach. In order to illustrate differences in no-prior and soft-prior regularization of experimental data, several phantom experiments were performed at 1100, 1300, 1500, and 1700 MHz. The geometry used in this study was the same as the simulations with the circular inclusion described in the "Mesh Resolution and Noise Level" section. Specifically, a 1.4 cm radius, thin-walled plastic cylinder filled with a mixture of 55% glycerin and 45% water was offset along the y-axis in the background medium (86:14 glycerin:water mixture) by 3 cm. [Figure 7] shows the images obtained with the two regularizations. In both instances, the inclusion is evident. Several background artifacts appear in the no-prior images, which are more pronounced in the conductivity parameter. Incorporating thespatial priors substantially improves the quality of both the permittivity and conductivity images. Weighted permittivity and conductivity errors decrease from 0.329 and 0.302 to 0.015 and 0.045, respectively, when the spatial structure of the phantom is incorporated through soft-prior regularization. [Figure 8] shows the reconstructed dielectric properties from the two approaches along the y-axis relative to the exact values. Clearly, the soft-prior regularization dramatically reduces the spatial oscillations within the background, but it also recovers the dielectric properties in the inclusion more accurately. Improvements are even more pronounced in the conductivity images in which case the recovered inclusion values are over-estimated and displaced (toward the boundary) without priors. These artifacts are eliminated when the spatial structure of the phantom is incorporated through soft-prior regularization. In all previous results, the soft-prior coefficient, λin equation 4, was set to unity as a default, but in this section, a more detailed study of the effects of λ as a function of frequency is presented. Data from the same experimental setup described in the "No-Prior versus Soft-Prior Regularization" section was used and images were reconstructed at 1100, 1300, 1500, and 1700 MHz. The independently measured dielectric properties of the coupling medium and the inclusion are reported in [Table 1] as a function of frequency. A spectrum of soft-prior coefficients was used for the reconstruction procedure, λ = 0.01, 0.1, 1, 10, and 100, based on testing over an even wider range of values in simulation and phantom experiments. Lower values, such as 0.001 for λ, allowed the solution to diverge in some cases, while higher values tended to suppress the recovered inclusion properties. Transects along the y-axis of the reconstructed images for and at 1100, 1300, 1500, and 1700 MHz for the range of soft-prior coefficients are shown in [Figure 9]. The weighted permittivity and conductivity errors associated with each image are computed and summarized in [Table 2]. In general, no observable difference occurred between the reconstructed values when λ=1.0 and λ=10. When λ=0.01 the recovered properties in the inclusion are close to the exact values, whereas those of the background begin to deviate from the true levels at higher frequencies. The λ=100 reconstructions appear to estimate the inclusion conductivity values closer to the true levels than the corresponding permittivities which are noticeably underestimated. The weighted property errors are elevated at all frequencies by an order of magnitude when compared to the two lower λcases. These results suggest that values in the range of λ=1.0 and λ=10 appear to be appropriate soft-prior weighting coefficients over our reconstruction frequency range (usually from 1100 to 1700 MHz). However, the stability of the weighting parameter λ investigated here is based on the present set of experiments, and other situations, for example, with multiple inclusions or different contrast levels may lead to different results and should be investigated further in the future. Table 2: Weighted εr and σ errors for a phantom experiment over a range of frequencies from 1100 to 1700 MHz using five different soft-prior coefficients: λ =0.01, 0.1, 1, 10, and 100. The behavior of soft-prior regularization in regions, which are identified prior to MI property estimation but do not actually have contrast, is of interest because of the potential of the approach to identify false inclusions based solely on the presumed structural information. [Figure 10] shows a reconstruction mesh with a false inclusion region (radius of 1.4 cm) centered at (0, 3cm) along with the previous target zone [Figure 1]. We used the same measurement data generated in the phantom experiments described in the previous section, where only a single inclusion at the lower location (0, -3 cm) actually existed. [Figure 11] shows the 1300 MHz reconstructed images when λ=0.01,λ= 0.1 and λ=1.0, respectively. The false region appears as a weak increase (~ 3 to 6%) in the permittivity images, but with a more pronounced decrease (~ -4% to -20%) in the conductivity images. 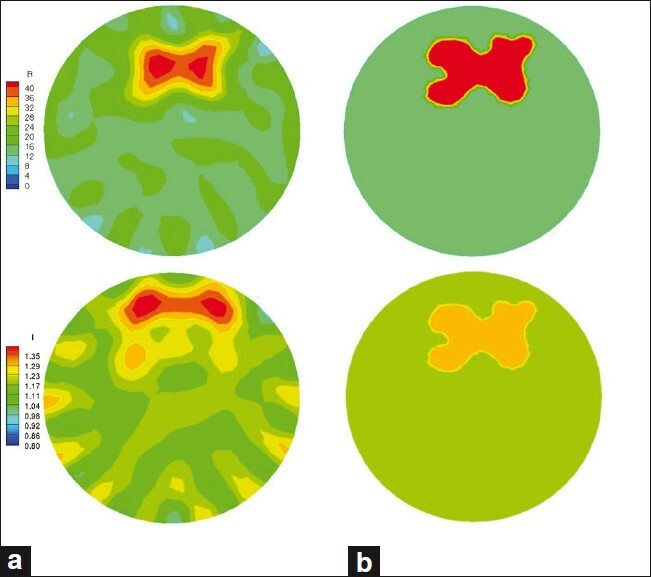 Transect plots through the inclusion in the permittivity and conductivity images are presented in [Figure 12]. 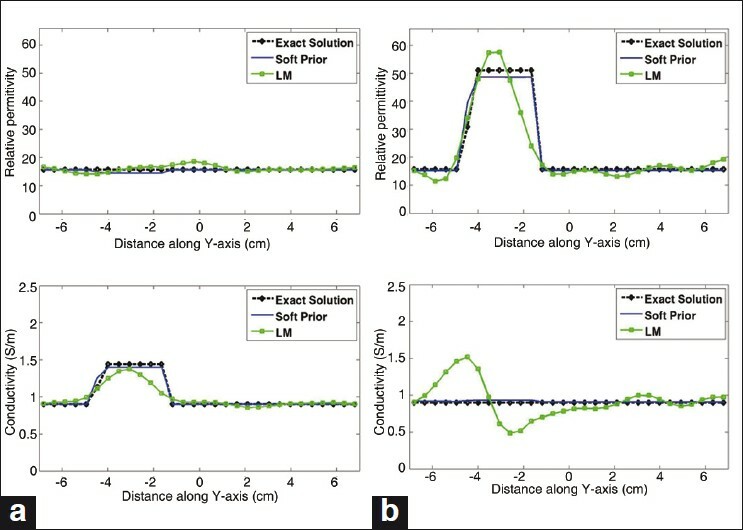 Consistent with the images in [Figure 11], the permittivity values within the false inclusion region are close to the true background, while the conductivity profile is more noticeably affected and exhibits lower values than the background liquid, especially when larger values of λ are used. Since the contribution from the soft-prior regularization is reduced when λ=0.01, the dielectric properties are not significantly influenced by the presence of the false inclusion region (~ 3% and ~ -4% error in the permittivity and conductivity images, respectively). However, for smaller values of λ, more artifacts are observed in the background. 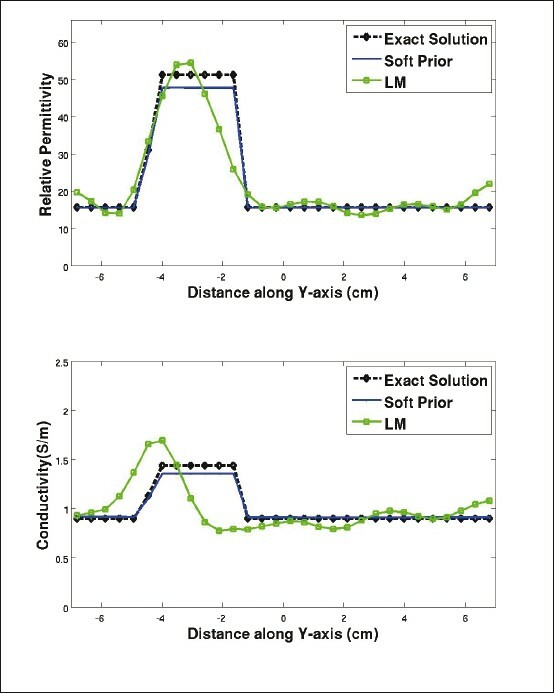 As the soft-prior weighting coefficient increases to λ=1.0, more error appears in the false inclusion region (~ 6% and ~ -20% in the permittivity and conductivity images, respectively). The weighted errors are reported in [Table 3]. For λ=1, = 0.131 and = 0.162, which are larger relative to the case when the exact spatial structure of the phantom was used ( = 0.015 and = 0.045), but significantly lower than those obtained without priors ( = 0.329 and = 0.302). We have shown that reconstructed images using simulation and measurement data with soft-prior constraints significantly improve the accuracy of the recovered dielectric properties compared with no prior regularization. We also confirmed that this improvement is not due to the number or distribution of nodes in the reconstruction mesh, but to the regularization matrix which incorporates structural priors into the reconstruction procedure. The weighted errors for the simulated 1300 MHz images with -100 dBm noise decreased by 83% and 87% for εr and σ , respectively, when the soft-prior regularization was used. Comparable error reductions of 95% and 85% were observed when using actual measurement data. Moreover, soft-prior regularization is considerably more robust in the presence of noisy data and an arbitrary-shaped inclusion, and is also able to dampen estimation parameter coupling effects, especially in the conductivity, much more readily than Levenberg-Marquardt regularization without spatial information. We also studied the range over which the soft-prior coefficient was optimal and the algorithm's behavior outside of this span. For a wide operating frequency range (1100 to1700 MHz), λ=0.1 to λ =10 produced similar high quality reconstructions with lower values causing divergence and higher values producing overly smoothed images. In the latter case, the recovered properties of the inclusion dropped significantly from the actual values to levels closer to the background. Finally, the sensitivity of the soft-prior approach to false inclusion regions was analyzed when using experimental phantom data. The results indicate that creating a false inclusion region and weighting it with the soft-prior regularization does introduce some bias, especially for larger weighting coefficients. For these experiments, the effect observed was a modest increase of 3--6% in permittivity and a more pronounced decrease in conductivity (~-4% to -20%) compared to the surrounding background. Overall, the deviations were relatively minor, and did not detract from the net benefit of improved property recovery in the true target zone. However, the false inclusion evaluated in the "Sensitivity to False Inclusions" section represents a simple example of an extreme case of imperfect shape and location of a region. The behavior of the algorithm when small errors occur in an actual inclusion boundary is an important consideration that warrants further investigation. Our initial results indicate that the MI property estimates deviate smoothly from the true values as location and shape errors increase, but a thorough study of the impact of true-inclusion boundary errors remains to be reported in the future. The occurrence of multiple inclusions, each potentially with its own contrast (that might prove to be true or "false"), has also not been studied, but is likely to occur during clinical imaging and needs to be understood as the MI soft-prior algorithm is refined and developed further. Since we have adapted methods for introducing spatial priors that have already been developed for NIR tomography, it is interesting to compare the general performances of soft-prior regularization with the two forms of data. Both imaging methods utilize model-based image reconstruction where the properties to be estimated depend nonlinearly on the measurements, but the NIR problem is governed by a time-harmonic diffusion equation whereas the microwave problem obeys a time-harmonic wave equation. No doubt the spatial priors dramatically improve the quantitative accuracy with which the respective image properties can be recovered with the two imaging systems. However, a striking difference occurs in the degree to which a false inclusion manifests itself and the amount of reconstruction parameter coupling that can result. In the NIR case, the contrast and coupling effects (on a true inclusion) of the false inclusion are much more significant than in the corresponding microwave reconstructions where very modest influences were observed. Additionally, the independence with which contrast in permittivity is recovered relative to conductivity; that is, the degree of estimated property parameter coupling is much less in the microwave case when spatial priors are invoked relative to the equivalent NIR problem where property parameter coupling is fairly significant (anywhere from 15% to 40% or more depending on noise level , compared to about 5% here). While these observations and assessments of the encoding of spatial priors favor the outcomes attained with MI (relative to NIR), some caution is advised not to over-interpret the results (e.g. in terms of property parameter coupling and the effect of false inclusions) because quantitative evaluations must be carefully controlled (e.g. in terms of contrast, inclusion size, location, etc) in order to represent a fair comparison between the two imaging techniques. Finally, the choice of 1/ N i as the weighting factor in equation (7) has not been optimized or extensively evaluated and other options are certainly possible. For example, since the elements in the reconstruction parameter mesh comprise different areas, a region-specific, area-related weighting factor might improve performance and is well worth exploring in the future. We have compared no-prior (Levenberg-Marquardt) versus soft-prior regularization in microwave image reconstruction under a series of representative circumstances. The findings have been supported by simulation and phantom results which indicate that including structural information in the form of a soft-constraint can significantly improve the recovered images both qualitatively and quantitatively. The implementation of soft-prior regularization is appealing because it demonstrates that current measurement data sets are sufficient (in combination with anatomical knowledge) to produce high fidelity reconstructions of experimental phantom targets which is an encouraging first step. The framework presented here sets the stage for extending the approach to more complex 2D and 3D phantom experiments and eventually to clinical patient data where anatomical images might be available from other modalities such as MR. This work was sponsored by NIH/NCI grant # R33 CA102938-04. 1. Chaudhary SS, Mishra RK, Swarup A, Thomas JM. Dielectric properties of normal & malignant human breast tissues at radiowave & microwave frequencies. Indian J Biochem Biophys 1984;21:76-9. 2. Joines WT, Zhang Y, Li C, Jirtle RL. The measured electrical properties of normal and malignant human tissues from 50 to 900 MHz. Med Phys 1994;21:547-50. 3. Surowiec AJ, Stuchly SS, Barr JB, Swarup A. Dielectric properties of breast carcinoma and the surrounding tissues. IEEE Trans Biomed Eng 1988;35:257-63. 4. Lazebnik M, Popovic D, McCartney L, Watkins CB, Lindstrom MJ, Harter J, et al. A large-scale study of the ultrawideband microwave dielectric properties of normal, benign and malignant breast tissues obtained from cancer surgeries. Phys Med Biol 2007;52:6093-115. 5. Poplack SP, Tosteson TD, Wells WA, Pogue BW, Meaney PM, Hartov A, et al. Electromagnetic breast imaging: results of a pilot study in women with abnormal mammograms. Radiology 2007;243:350-9. 6. Fear EC, Hagness SC, Meaney PM, Okoniewski M, Stuchly MA. 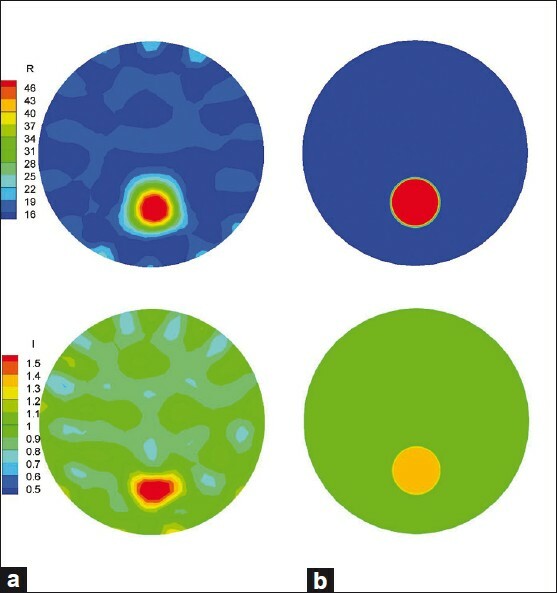 Enhancing breast tumor detection with near-field imaging.IEEE Microwave magazine2002. p. 48-56. 7. Kaltenbacher B. Some Newton-type methods for the regularization of nonlinear ill-posed problems. Inverse Probl 1997;13:729-53. 8. Arsenin VY, Tikhonov AN. Solutions of ill-posed problems. Washington Winston & Sons; 1977. 9. Meaney PM, Fang Q, Rubaek T, Demidenko E, Paulsen KD. Log transformation benefits parameter estimation in microwave tomographic imaging. Med Phys 2007;34:2014-23. 10. Meaney PM, Paulsen KD, Pogue BW, Miga MI. Microwave image reconstruction utilizing log-magnitude and unwrapped phase to improve high-contrast object recovery. IEEE T Med Imaging 2001;20:104-16. 11. Grzegorczyk TM, Meaney PM, Jeon SI, Geimer SD, Paulsen KD. Importance of phase unwrapping for the reconstruction of microwave tomographic images. Biomed Opt Express 2011;2:315-30. 12. Caorsi S, Pastorino M. Two-dimensional microwave imaging approach based on a genetic algorithm. IEEE T Antenn Propag 2000;48:370-3. 13. Donelli M, Massa A. Computational approach based on a particle swarm optimizer for microwave imaging of two-dimensional dielectric scatterers. IEEE T Microw Theory 2005;53:1761-76. 14. Rocca P, Benedetti M, Donelli M, Massa A, Presented at the Antennas and Propagation Society International Symposium APSURSI '09 IEEE, 2009. 15. Tarantola A. Inverse problem theory: methods for data fitting and model parameter estimation. Amsterdam ; New York: Elsevier; 1987. 16. Fhager A, Persson M. Using a priori data to improve the reconstruction of small objects in microwave tomography. IEEE T Microw Theory 2007;55:2454-62. 17. Chew WC, Lin JH. 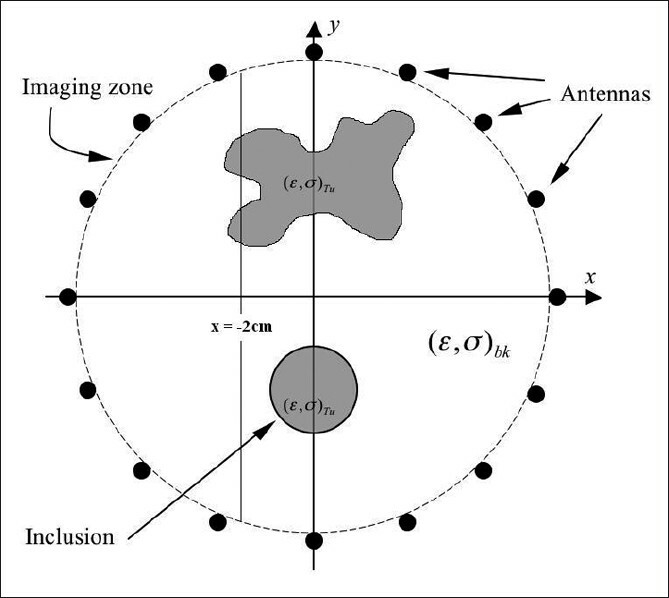 A Frequency-Hopping Approach for Microwave Imaging of Large Inhomogeneous Bodies. IEEE Microw Guided W 1995;5:439-41. 18. Caorsi S, Gragnani GL, Pastorino M, Sartore M. Electromagnetic Imaging of Infinite Dielectric Cylinders Using a Modified Born Approximation and Including a-Priori Information on the Unknown Cross-Sections. IEEE P-Microw Anten P 1994;141:445-50. 19. Benedetti M, Donelli M, Franceschini G, Pastorino M, Massa A. Effective exploitation of the a priori information through a microwave imaging procedure based on the SMW for NDE/NDT applications. IEEE T Geosci Remote 2005;43:2584-92. 20. Joachimowicz N, Pichot C, Hugonin JP. Inverse Scattering - an Iterative Numerical-Method for Electromagnetic Imaging. IEEE T Antenn Propag 1991;39:1742-52. 21. Feron O, Duchene B, Mohammad-Djafari A. Microwave imaging of inhomogeneous objects made of a finite number of dielectric and conductive materials from experimental data. Inverse Probl 2005;21:S95-S115. 22. Dorn O, Miller EL, Rappaport CM. A shape reconstruction method for electromagnetic tomography using adjoint fields and level sets. Inverse Probl 2000;16:1119-56. 23. Litman A. Reconstruction by level sets of n-ary scattering obstacles. Inverse Probl 2005;21:S131-S52. 24. Ferraye R, Dauvignac JY, Pichot C. An inverse scattering method based on contour deformations by means of a level set method using frequency hopping technique. IEEE T Antenn Propag 2003;51:1100-13. 25. Osher SJ, Santosa F. Level set methods for optimization problems involving geometry and constraints I. Frequencies of a two-density inhomogeneous drum. J Comput Phys 2001;171:272-88. 26. Crocco L, Isernia T. Inverse scattering with real data: detecting and imaging homogeneous dielectric objects. Inverse Probl 2001;17:1573-83. 27. El-Shenawee M, Dorn O, Moscoso M. An Adjoint-Field Technique for Shape Reconstruction of 3-D Penetrable Object Immersed in Lossy Medium. IEEE T Antenn Propag 2009;57:520-34. 28. Brooksby BA, Dehghani H, Pogue BW, Paulsen KD. Near-infrared (NIR) tomography breast image reconstruction with a priori structural information from MRI: Algorithm development for reconstructing heterogeneities. IEEE J Sel Top Quant 2003;9:199-209. 29. Kuhl CK. The current status of breast MR imaging - Part I. Choice of technique, image interpretation, diagnostic accuracy, and transfer to clinical practice. Radiology 2007;244:356-78. 30. Brooksby B, Jiang SD, Dehghani H, Pogue BW, Paulsen KD, Weaver J, et al. Combining near-infrared tomography resonance imaging to study in vivo and magnetic breast tissue: implementation of a Laplacian-type regularization to incorporate magnetic resonance structure. J Biomed Opt 2005;10:-. 31. Taflove A, Hagness SC. Computational electrodynamics : the finite-difference time-domain method. 3rd ed. Boston: Artech House; 2005. 32. Kelley CT. Iterative methods for linear and nonlinear equations. Philadelphia: Society for Industrial and Applied Mathematics; 1995. 33. Fang Q. Computational methods for microwave medical imaging Hanover: Dartmouth College; 2004. 34. Dehghani H, Pogue BW, Jiang SD, Brooksby B, Paulsen KD. Three-dimensional optical tomography: resolution in small-object imaging. Appl Optics 2003;42:3117-28. 35. Pogue BW, Paulsen KD. High-resolution near-infrared tomographic imaging simulations of the rat cranium by use of apriori magnetic resonance imaging structural information. Optics Letters 1998;23:1716-8. 36. Pogue BW, Zhu HQ, Nwaigwe C, McBride TO, Osterberg UL, Paulsen KD, et al. Hemoglobin imaging with hybrid magnetic resonance and near-infrared diffuse tomography. Adv Exp Med Biol 2003;530:215-24. 37. Lynch DR. Numerical partial differential equations for environmental scientists and engineers : a first practical course. New York: Springer; 2005. 38. Yalavarthy PK, Pogue BW, Dehghani H, Carpenter CM, Jiang SD, Paulsen KD. Structural information within regularization matrices improves near infrared diffuse optical tomography. Opt Express 2007;15:8043-58. 39. Meaney PM, Fanning MW, Raynolds T, Fox CJ, Fang Q, Kogel CA, et al. Initial clinical experience with microwave breast imaging in women with normal mammography. Acad Radiol 2007;14:207-18. 40. Meaney PM, Paulsen KD, Ryan TP. 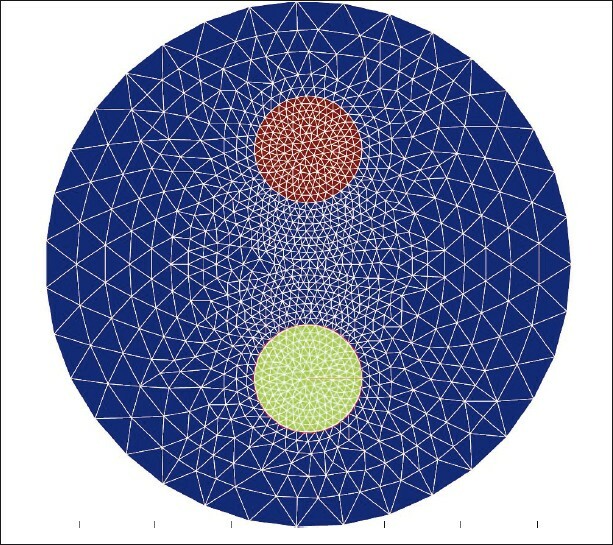 2-Dimensional Hybrid Element Image-Reconstruction for Tm Illumination. IEEE T Antenn Propag 1995;43:239-47. 41. Yalavarthy PK, Pogue BW, Dehghani H, Paulsen KD. Weight-matrix structured regularization provides optimal generalized least-squares estimate in diffuse optical tomography. Medical Physics 2007;34:2085-98. Golnabi, A.H. and Meaney, P.M. and Paulsen, K.D. Meaney, P.M. and Goodwin, D. and Golnabi, A.H. and Zhou, T. and Pallone, M. and Geimer, S.D. and Burke, G. and Paulsen, K.D. Meaney, P.M. and Zhou, T. and Goodwin, D. and Golnabi, A. and Attardo, E.A. and Paulsen, K.D. Epstein, N.R., Golnabi, A.H., Meaney, P.M., Paulsen, K.D.